So we try to eat fish at least once a week. Salmon is one our favorites, but you can easily switch this out with another fish if your family is not a fan of salmon. Fish cooks very quickly, which is why it is one of my go-to's on a weeknight. 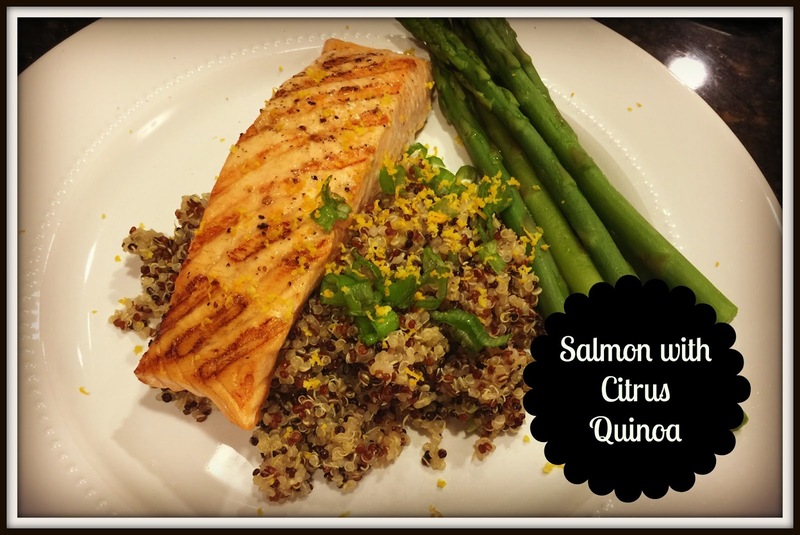 This Salmon with Citrus Quinoa is made with some simple ingredients and is delicious! Start by cooking your quinoa according to package instructions. Then drizzle your salmon with a little EVOO and sprinkle with salt and pepper. You can either grill it (about 5-6 mins per side) or put the fillets into the oven (on a foil lined pan) at 425 for about 15 minutes. While your fish & quinoa are cooking, you can make a quick flavoring for your quinoa. Mix 3 TBSP of olive oil with juice & zest of half an orange and 2 TBSP of chopped scallions or chives. Pour this over your cooked quinoa and toss to coat. Squeeze the other half of the orange over the salmon when if comes out of the oven. Place the salmon over your couscous and add something green to round out your plate!